The 5th Goa 2016 Edition is this time a carefully selected journey into the world of dreamlike progressive and psychedelic Trance from the leading artists of that genre. 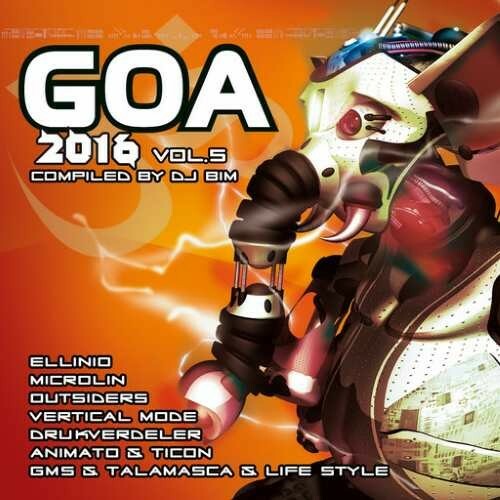 Compiled by DJ Bim, GOA 2016 excites over more as 2 hours from 'Hands In The Air' Morning Trance featured by into delightful progressive and psychedelic Trance material out there. Features artists are GMS and Talamasca and Life Style, Vertical Mode, Outsiders, Symbolic and Electric Universe, DigiCult vs U-Recken, Azax and Pettra, Yoake, Animato and Ticon, Rocky Tilbor, Drukverdeler, Microlin, Ellinio, Atacama and Jakaan, Impact, Tronsho, Shivatree, Freaked Frequency and Tropical Bleyage. All contributing to this fantastic double pack suitable for the lover of charming progressive moods and Psychedelic dreams.